One of the birds most likely to delight visitors to Pickerings Pasture Local Nature Reserve and the surrounding area is the peregrine falcon. Although they are fairly regular visitors to the estuary and Hale Marsh they are not always easy to spot: despite their size. 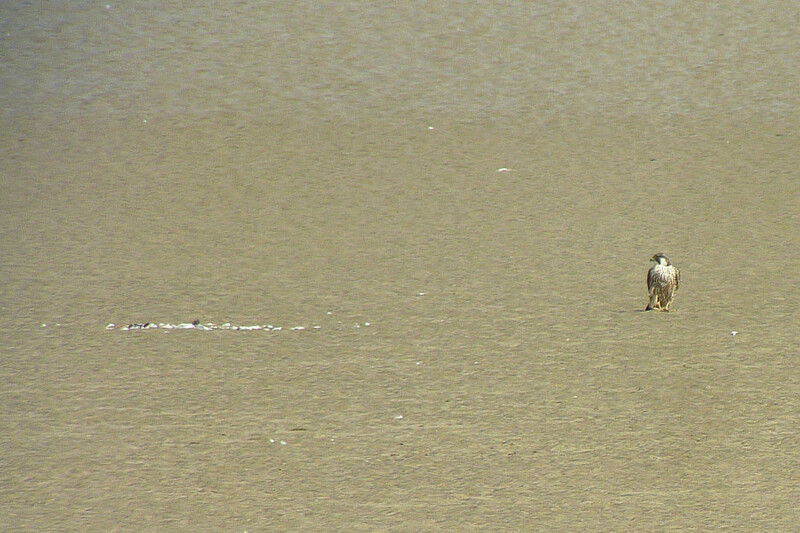 The first indication of a peregrine is usually seeing the waders etc. rising from their roosting / feeding areas and rising higher and higher in a tight-knit flock. They usually start to stream off up the river but sometimes they just circle higher over the marsh. The birds will always know where the peregrine is once it is spotted and act together as a group. The peregrine is most likely to be above the circling flocks: preparing to stoop upon a weak or injured bird but often a pair will act together: usually the visible male pushing the birds up while the larger female is out-of-sight high above them: preparing to strike. As the world’s fastest animal, seeing a peregrine stoop at the flock is an amazing sight but not one you witness very often. 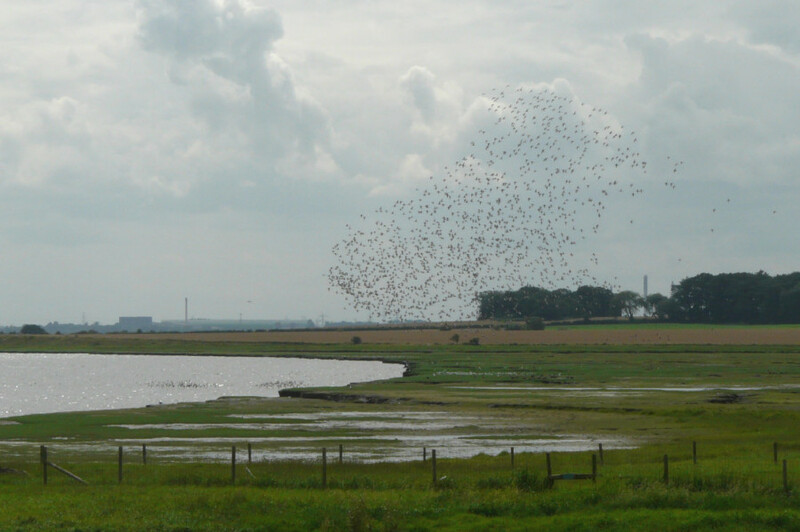 Dunlins gathering in a tight flock. 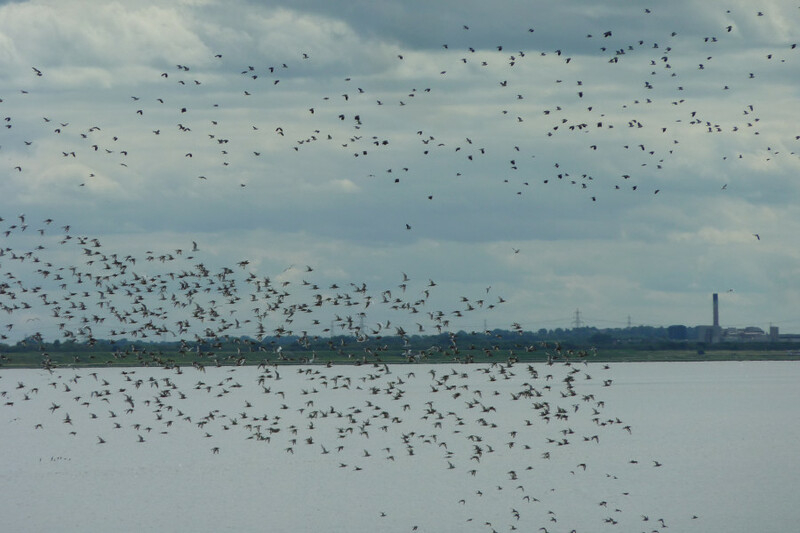 Lapwings often gather over the river before rising . The peregrine is our largest falcon with broad, pointed wings and quite a short tail giving it the distinctive “anchor” shape in flight. It is blue-grey above with a blackish top to its head and a white face. Characteristically it has an obvious black moustache that can be distinguished at long range. 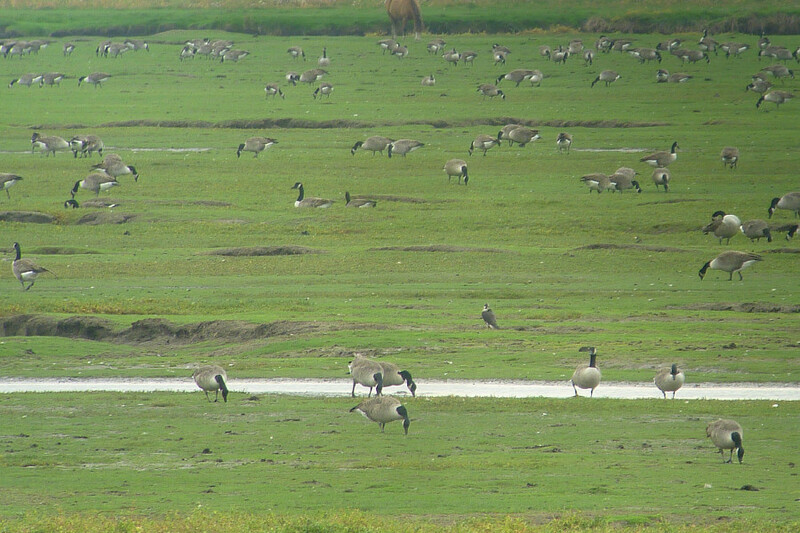 A peregrine sits out on Hale Marsh with the geese. A peregrine on the old tree. This one is on the sandbank having finished her meal. You can see the remaining feathers on her right. Unfortunately this is the view you are most likely to get at Pickerings! They often sit out on Hale Marsh and once you get to know what to look for it is easy to pick them up but they are nearly always a long way off. They frequently sit on the bank of the Ramsbrook or on the edge of ditches even further away. 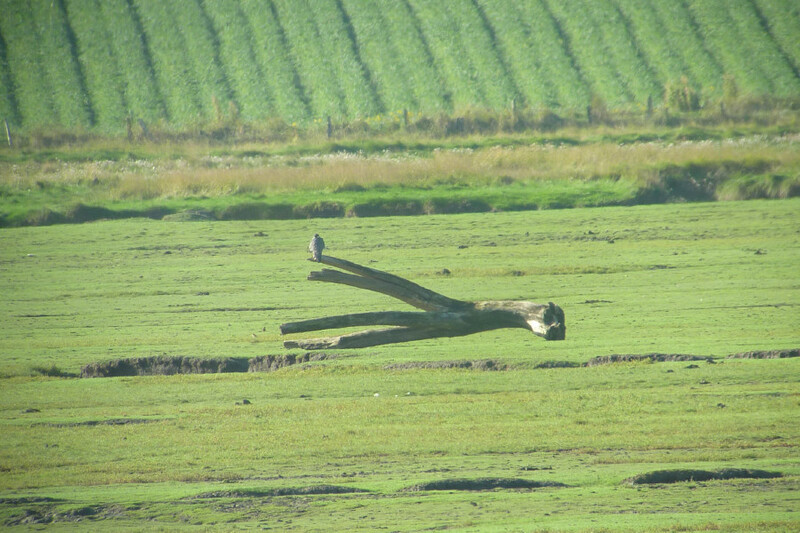 Until recently there was a dead tree out on the marsh and they were easier to spot as they often used it as a perch. Even so with binoculars they are fairly easy to find on the ground although a good telescope will give you a brilliant sighting. 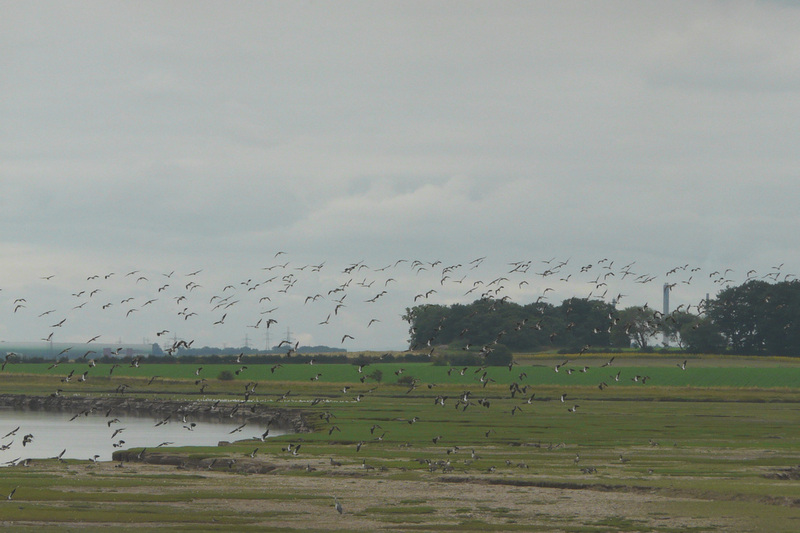 A further clue to their presence on the marsh or the sandbanks is when they are mobbed by the crows or ravens. There is no love lost between these species and the corvids will continuously aggravate a peregrine until it moves on or give up its meal. One such event was recorded in October 2013: “The real highlight of the trip was a magnificent display between a peregrine falcon and the local crows. Initially the peregrine took umbrage against a particular crow: she hassled it continuously for several minutes, flying high above it and stooping many times, hitting it on the wing and on at least one occasion almost knocking her into the waves. Eventually they both flew off up-river and peace was restored. That was just the beginning – ten minutes later the peregrine was back but the table had turned: she was harassed by up to six crows, often two at a time. The peregrine usually left it till the last second before slipping away from under the crow’s attack: sometimes she left it too late and they knocked her off balance, quickly to recover and go into the next attack." 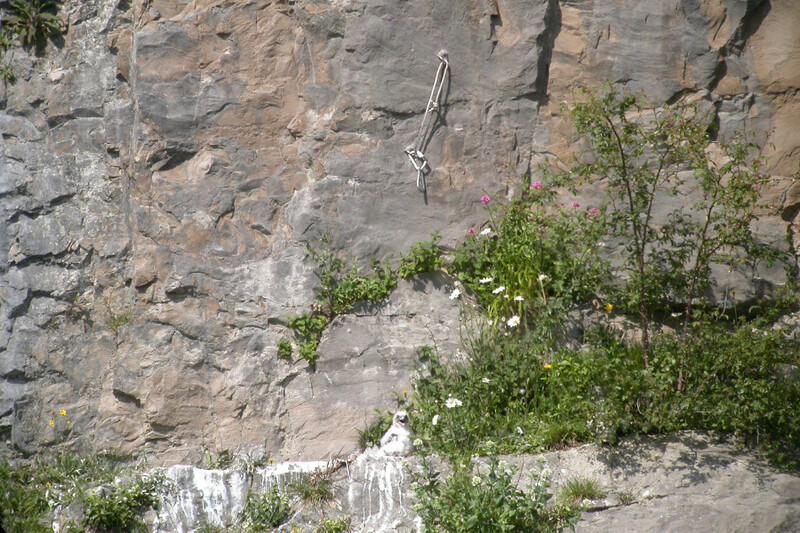 An adult peregrine on its craggy ledge. There have been several breeding sites locally for the peregrines. They have bred successfully on local cliffs and buildings, in the past they have even tried nesting on the Widnes / Runcorn bridge. Traditionally they nested on sea cliffs or in craggy upland areas but nowadays they are far less fussy and will nest anywhere that resembles a cliff face: cathedrals, towers and even multi-storey flats in some areas of the country. In the 60’s and 70’s peregrines were almost wiped out in Britain because pesticides were allowed to enter the food chain and this thinned the eggs of our top predators so they failed to produce young. Only birds in remote areas of Scotland were spared. Added to this peregrines suffered from illegal killing by gamekeepers and pigeon fanciers and were also targeted by egg collectors. Fortunately better legislation over pesticides and legal protection for the birds has helped to reverse the decline although the battle is still not over. There are still many of our precious birds of prey, including peregrines, targeted by over-zealous gamekeepers, the eggs are taken by fanatical collectors, the young still removed from their nests by a few dishonest falconers and in some places are deliberately shot or poisoned. The RSPB, amongst other organisations, still have to maintain vigilance at nesting sites and organise education programmes to try to eradicate this problem. Please protect and enjoy our local peregrines. 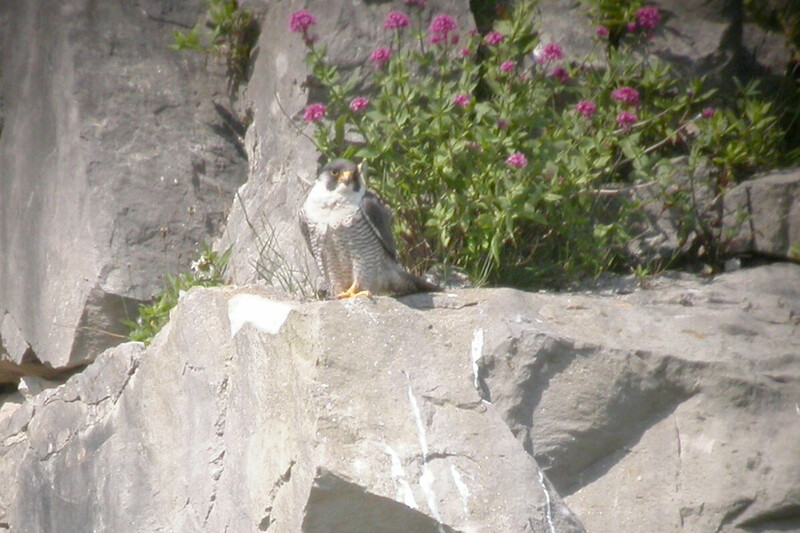 A young peregrine on its nesting ledge. Above you can see the rope used to try to steal their eggs. The perpetrators were caught this time.